The seamen's strike in 1878 was the first intercolonial dispute in Australia. The Australasian Steam Navigation Company decided to replace all their Australian seamen with Chinese seamen in late 1878. The reason: they were paying Australian seamen eight pounds per month, but could get away with paying Chinese seamen three pounds per month. Seamen in Victoria, New South Wales and Queensland went on strike on the 17th of November 1878. They were supported by miners in New South Wales and by wharfies [dock workers] in the three colonies. The company was able to keep a skeleton service going, when 21 Sydney wharfies blacklegged and loaded ships that had Chinese crews. 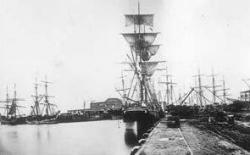 On Saturday the 7th of December 1878, a crowd had gathered outside the Australasian Steam Navigation Companies wharf and when the blacklegs had finished work and made their way home, the crowd began hooting the strike breakers. Sixty police on foot and six mounted troopers turned on the crowd and beat many of the demonstrators senseless. A compromise settlement was reached by the seamen and the company on the 2nd of January 1879. The company agreed to discharge its Chinese crews over the next two years and re-employ the Australian seamen whose jobs had been terminated. The Maritime Strike in 1878 put the question of race, international capital and labour squarely on the colonial political agenda. International capital claimed the right to employ anyone they wanted to. Workers from Southern China and the South Pacific were targeted by international capital because they could get away with paying them a pittance. Local colonial workers found they had become the disposable part of the labour equation. They formed associations and unions to fight this attempt by the merchants of the late 19th Century to employ virtual slave labour. The early trade union movement owed much of its early success to the fact that people understood that if they didn't unite and fight for the right to keep their jobs, everyone, both indentured workers and locals would be the losers. It's easy, very easy to label the early union movement as a bunch of racists, what many commentators seem to forget is that many of the racist sentiments that were aired were caused by the attempts of local and international merchants to use indentured Chinese and South Seas labour to cut their operating costs. Another major strike of Australian maritime workers in 1890 was, however, to end in defeat.